There are waterfalls of subtle shadows from roof to foundation on this striking home. 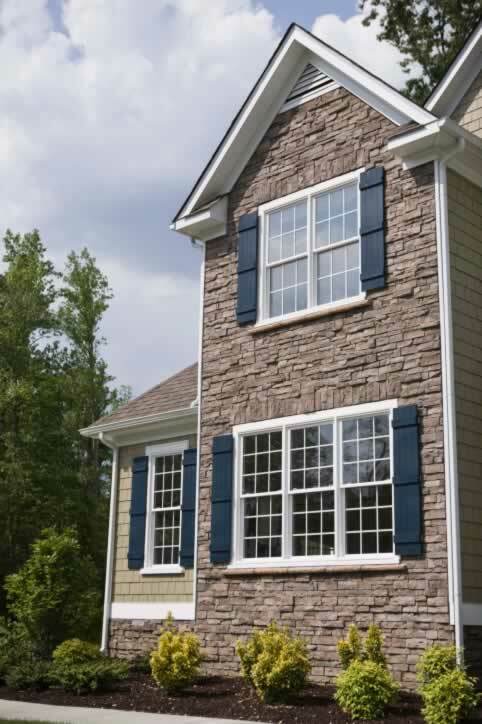 The roof shingle color cascades down the stone accent wall, with subtle rippling shadows. Shade under the eaves, window sills, siding shingles, and even the tops of the double-hung windows give a feeling of movement to what is, in simplest terms, a collection of rectangles. The shuttered windows, whether single-, double-, or triple-wide, are the boldest rectangles of all, and the fine wood muntins, which create the illusion of separate glass panels, frame the deepest shade of all - the home's interior. (The muntins are sandwiched between double-pane glass for easy cleaning.) Raise all the lower windows to air out the house and the dark rectangular spaces would change the wall's composition. It's not easy to pull off such interplay of shapes and shadows, but this home does it with quiet aplomb.